Gujranwala Electric Power Company (GEPCO) has announced the eligible and eligible candidate list of following posts. These jobs were declared vacant some months ago. Notice for the candidates (eligible/Not eligible) for the post of Naib Qasid/Store Helper and ALM. Note:- If You Want to Check Your Name in the Candidate List, Writ Your Name, CNIC and City Name with Post Name applied for, in the Comment Box Given Bellow. 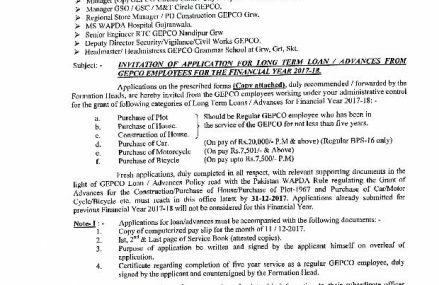 With reference to the advertisement of vacant positions dated 22-09-2016 in daily The News, Naw-e-Waqt & Pakistan, GEPCO has uploaded the lists of provisionally shortlisted candidates for the posts in BPS-01 to BPS-05, Phase-III (03 Nos. categories) on its official website (www.gepco.com.pk) as well as on notice board. 1. No observation/objection submitted by hand will be entertained. 2. Observations/objections received after 22-09-2017 will not be entertained. GEPCO will not be held responsible for late delivery of the same by courier agency. 3. Telephonic contact or any influence / reference used in this regard will be considered as non-eligibility. Nauman Ali. father Name.Muhammad Taj. .37201_7849591_7. Post Off ALM . Sir my name is muzamal hussain.s/o.muhammad mushtaq. Hassan raza s/o mohammad younas narowal tehsil zafarwal..
Sir jin logon ka test 12 oct ko hua tha unka result kesay maloom kia ja skta hai..?? Dear sir plz teel me about my post..
Piyyam Ameer S/O Sadaqat Hussain, CNIC# 3420279911815, for the post of store helper. ADMIN please tell i’m eligible candidates or not? Dear Saleem, Good luck Next Time. You are over Qualified..
Sr.No.Name Father’s Name CNIC No. Write your Post Name applied for? Saif Ullah Father’s name Muhammad Latif….. Selected for ALM or not???? Write Your Post Name you Applied for? Test ho ga ya interview? Fahad parviaz s/o Ahmed Ali cinc no 34101 3684424 5 district gujranwala. Test ho ga interview ho ga? Congratulation Dear You are in the List. Sr.No. 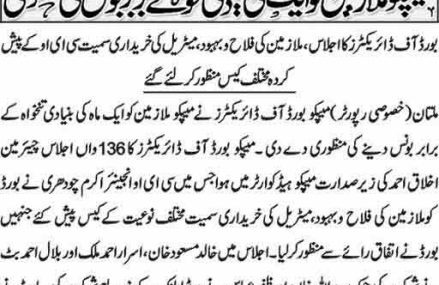 Name Father’s Name CNIC No. Dear Fahad Congratulation Your Name is included in Eligible Candidate List. Dear Congratulation, You Name is in the List of eligible candidates. Dear Congratulation, Your Name in the list of eligible candidates..